There is the possibility of confusion when it comes to vertical lifts. 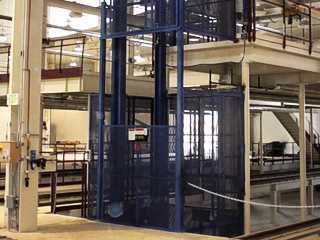 Vertical Lift Modules are automated storage and retrieval machines that store or stage product within itself and bring the product to the person. Hydraulic Vertical Lifts are typically one stage lifts taking product from one height to another height. Mechanical Vertical Lifts are typically multi-stage lifts taking product from one height to several possible heights or levels. Mezzanine lifts typically move product from the ground height to the mezzanine height. Vertical lifts can have large decks or small decks as required by the application. Vertical lifts cannot transport people! Elevators transport people. Industrial product elevators can be acquired which are rated for both heavy product (even lift trucks) and people. These are typically found in manufacturing facilities. The term VRC (Vertical Reciprocating Conveyor) is sometimes used for vertical lifts. With these lifts the product is typically loaded with automation and discharged via automation such as conveyor, but not always. CSI provides vertical lifts in a variety of configurations to fit the application. We also offer other equipment to move product vertically such as Conveyor, Scissor Lifts, and Dock Lifts.